This is the sequel to our article on the best car booster seats for dogs. As the aforementioned article was mostly intended for small to medium size dog breeds, this one, on the contrary, is dedicated to larger breeds due to the suitability of the products. Why must you have a car seat or a harness for your dog? It’s a self-evident thing to have a special seat and a safety-strap if you take a human baby with you, however, a lot of people seem to neglect the fact that you can think of even more reasons why they’re necessary for your pet. Have you ever had to take off your hands from the steering wheel just to ensure the dog doesn’t climb over to the front seat or disturb you in some other way? It’s likely you’ve experienced this, and even if not, you should not wait for it to happen to prove the point – the dog can be a bigger distraction than a baby. If you’re still unsure of the risk, we suggest you dive into this study of risk factors when driving with pets. HM tip: As discussed previously, car booster seats are mostly intended for small to medium-sized breeds (40-50 pounds max). For the larger dogs, such as German Shephard, you’ll want to look into dog car harness specifically. How to choose the best dog car harness? Now that you know how underestimated the car seat and harness are and that you actually must have one of them to transport your four-legged companion, it’s time to realize what exactly you must consider before purchasing such item for your pet’s safety and comfort (and, undeniably, your own simultaneously as well). Safety-wise, you must look for a dog harness that has a solid attachment to the car seat itself. It’s also important to have security leashes that are adjustable and latch to the dog well in order to ensure your dog is fixed to the car seat and safe at all times whilst traveling. Comfort-wise, while the leashes should latch well to your companion and the car seat, your four-legged friend should also be able to lay down and stand up in case of longer journeys. Since we’ve been reviewing many products/accessories for dogs, Ruffwear is the brand that has constantly left a positive impression on the given item – and this dog car harness is no exception. You can choose from 5 different sizes and each of them has well adjustable straps. The material quality that has gone into this one really is top-notch, including the all-metal hardware. You’ll be delighted to hear that it can be attached to virtually any known type of seatbelt in a car. 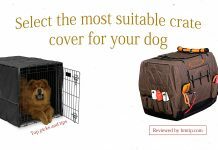 It’s also quite easy to put on your pup, and, if done properly, your traveling companion should feel very comfortable in it (bear in mind, however, that the first couple times can be a bit stressful for some as dogs usually don’t like any kind of additional accessory put on them). Your four-legged friend will be able to both stand up and lay down easily if adjusted accordingly while also being safe. Though not the highest, the price of Ruffwear – Load Up Vehicle Restraint Harness for Dogs may still be a drawback for some. If it encourages you more, know that this product has been crash-tested under the conditions outlined in Federal Motor Vehicle Safety Standard 213 – not something every other product on the market, or even this list, can boast about. HM tip: Overall, definitely one of the very best dog car harness out there – just make sure you get the right fit (size) for your dog! The manufacturer provides solid instructions there, therefore, we’ll take the liberty to skip on that part. Speaking of well-made and crash-tested car harness for dogs, we have to mention this product by 4×4 North America – very durable material (nylon and stainless steel construction) and comfort for your pal at the same time. This is achieved by the well-designed V cut of the neck – therefore also no pressure on dog’s trachea. Beware, however, that there are many crash tests performed both in Europe and USA, and the product did not pass one in 2013. Now, it doesn’t mean it’s less safe all of a sudden, it just proves it’s nothing miraculous when compared to other ones in the list. The reflective material (banding) for increased visibility might be considered a redundancy, however, since this dog harness can be used for walking as well, we consider it a nice extra – it can be useful in case of any kind of emergency anyway. This is, however, no miracle savior in itself as implied before – the straps are adjustable and this feature must be used properly to ensure the safety. One of the main drawbacks here may be the high price. With all that being said, The Original AllSafe Harness definitely deserves to be on the highest-rated dog car harness for its undeniable quality construction that is excellent for long-distance travels. HM tip: Consider this an excellent choice for longer journeys. Additionally, it may serve you well as a great walking harness in a leash when you’re on the road and want to stretch out your companion’s paws and your own feet (so you don’t have to bring a separate one for this purpose), even in nighttime. We believe this dog car harness also deserves your attention – it features four adjustable web closures that can be well adjusted to your dog’s chest. In fact, if the right size is chosen, this might be one of the best fitting harnesses out there. Actually, you only have to fit the harness to your dog once. From then on, the Harness can be taken on and off swiftly using the Mag-Lok Instant Fit closure system. Furthermore, it’s rather lightweight, yet, sturdy and secure. Additionally, you can use this product as a harness for walks as well. It’s an excellent choice for longer travels as it fits well both in and out of the car. The main drawback here might be the relatively high price. Other than that, this makes one of the best dog car harnesses in the overall comparison. 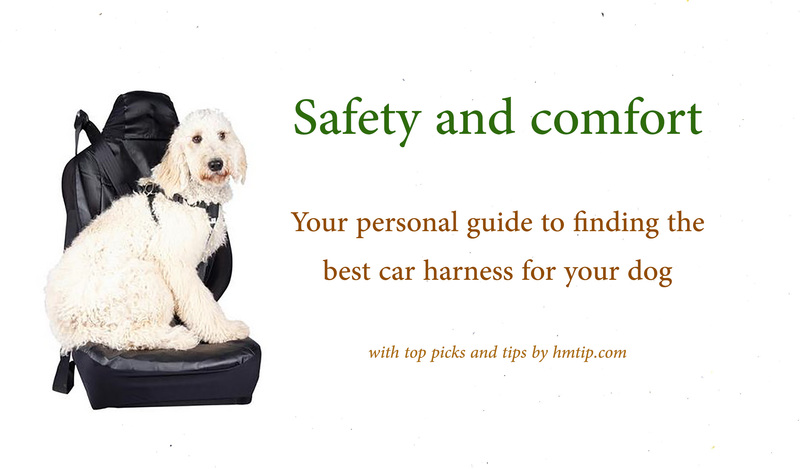 HM tip: This car harness will simplify your life as it’s so easy to use (you only have to adjust it once). If you like to keep it also good-looking, however, be sure to wash it carefully with your hands as the color may fade away. Unlike The Original AllSafe Harness, we would not recommend Sleepypod Clickit Sport Utility for walking – it’s just not convenient for that because of the shape and weight. However, it’s not what we are focusing on here – it’s very durable dog car harness that has shown excellent results in crash tests (e.g., it passed the 2013 CPS trial without any problems). The 3-point contact with car seatbelt ensures improved safety. Also, the well-made pad only adds up to criteria. Sleepypod Clickit Sport Utility comes in 4 different sizes and various colors. Note, however, that this harness is designed for dogs with thicker necks, therefore, it’s not really suitable for such breeds as Whippet, Greyhound, Saluki, and Afghan Hound. Overall, this car harness for dogs possesses quality features (ballistic nylon exterior construction and automotive grade seatbelt webbing, for instance) that are really beneficial when used appropriately, that is, for transport purposes and dogs with thicker necks and heads than the aforementioned breeds. HM tip: Consider this a magnificent choice for a decent price for your pup unless 1) you own a breed with fragile neck, 2) you plan on using the product for walks as well. In those cases, there are better options, like our previous three picks. A nice lightweight option for those whose pockets are a bit more restricted. We found surprising that this relatively cheap dog car harness has lifetime warranty added. Yet, we wouldn’t place our trust on that alone. This dog car harness allows your companion to sit, lay down and stand up easily whilst also providing solid protection. With that being said, we feel obliged to point out that the material is less durable than our previous picks, and the single-attachment also seems a bit riskier. Nevertheless, it’s better than nothing. And also more universal than, let’s say, our pick No. 3 (see the comments about suitability). For instance, it can be used for walks as well. With everything in mind, we’d call Solvit Deluxe Car Safety Harness the best budget option on the market today. HM tip: If your hands are tied, consider this a better budget alternative. If you are going to use a dog harness instead of a booster seat which are more appropriate for smaller dog breeds, we highly suggest you get a dog car seat cover, too, to protect the seats. For backseat (where we recommend placing your dog while transporting), we would, again, recommend a product from Ruffwear – Ruffwear Dirt Bag Seat Cover – as we recognize the durable waterproof fabric that is easy to clean. However, if you prefer another brand, be our guest and go with your personal favorite – just make sure it has the same qualities we mentioned above. 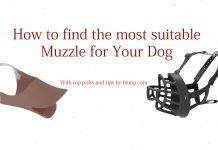 The purpose of this article was to find the best dog car harness for large breeds as we’ve dedicated another article (Car booster seats) for smaller breeds, meaning, each top had different considerations. After following our guidelines above, you should have a much clearer picture of what to look for in a harness when it comes to transporting your four-legged companion safely. Remember that there isn’t one perfect universal solution for all breeds and circumstances. Understand yours, pack yourselves with the knowledge gained here, and apply it all when it comes to deciding on a certain product. As always, feel free to reach out to us if any questions or concerns arise – we’re here to assist.